Berry crisp is a great summertime dessert. I made it while we were visiting Florida where it definitely felt like summer. It is best served warm with vegan ice cream, yum! I used frozen fruit, but you could always use fresh berries. I also used a mixture of all different berries, but just use your favorite. The crisp topping is delicious with the warm, juicy berries. 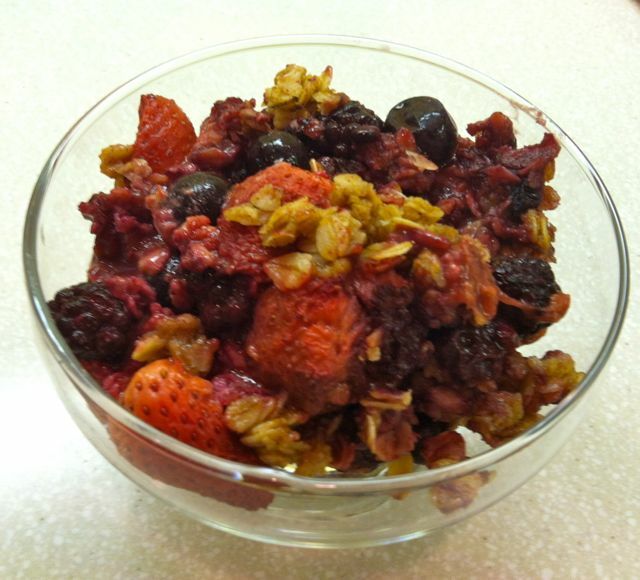 I actually ate the leftovers of the berry crisp for breakfast the next morning. Now that we are back in North Carolina I can’t wait to make a berry crisp with the fresh strawberries that are in season now. Preheat the oven to 375. Place the berries in a large baking dish and toss with the 2 TBSP of flour until all the berries are coated. In a mixing bowl combine the oats, 1/2 cup of flour, brown sugar, cinnamon and Earth Balance to make the topping. Mix it until it is well combined. Crumble the topping evenly over the berries. Bake 40 – 50 minutes until the topping is golden brown and the berries are bubbling. Let cool at least 10 minutes before serving. Serve the berry crisp with a scoop of vegan vanilla ice cream. All I can say is YUM! I hate it for dessert and breakfast the next two days!